Ever felt that your treasured iPhone or HTC is just too fat for your pocket? No, us neither, but researchers in Canada are set on convincing us that thin is the way forward with the world's first paper-thin phone being unveiled on later this month by researchers from Queen's University, in cooperation with Arizona State University and Amazon Kindle 2 creators E Ink Corporation. 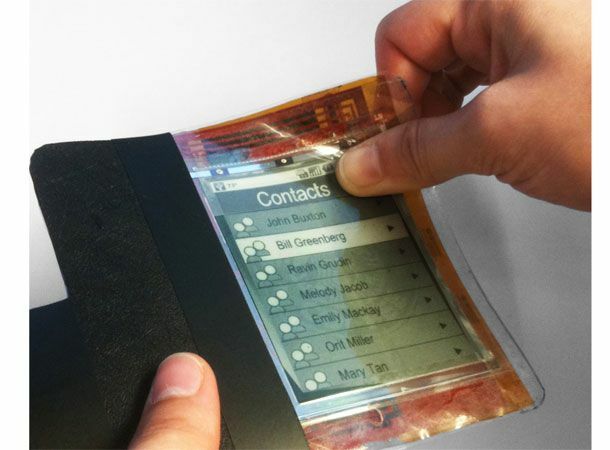 Albeit still in the concept stage, the so called 'flexible iPhone' does everything a smartphone can, allowing the user the read books, play music, or make calls, however, being as thin as a piece of paper, the phone redefines the user experience, making pinching and swiping a screen so last year. “This is the future. Everything is going to look and feel like this within five years,” says confident creator Roel Vertegaal, director of Queen's University whilst speaking to US paper Vancouver Sun. So, besides being a phone which doesn't break when you drop it, what use is it? Well, the product could lead to revolutionary new ways of interacting with computer devices, particularly for people with poor eyesight or other age-related ailments that prevent coordinated touch control. No doubt also that as the technology improves in complexity and durability, we could see it unleashing a whole new generation of tablet computers. The device will be unveiled officially on May 10 at the Association of Computing Machinery's CHI 2011 (Computer Human Interaction) conference in Vancouver. What do you think to the paper thin smartphone? Get involved in the converation on T3's Twitter and Facebook pages.